of permanently fitted lock instead. We recently received a sample of the "Mighty Amsterdam" lock. It's a bicycle look which looks a bit like the sort of wheel lock used on virtually every utility bike in the Netherlands, but it's not actually a real one.. Amazon describe it as "Straight from the Bicycle Capital of the world", but it's not really that either. If you use this to secure your bicycle in Amsterdam it'll likely be stolen. I've only ever seen one of these locks - our sample. Some retailers say it comes from Germany. I suspect it may really be made in China. In any case, it's merely a pretend "Dutch" lock and really not the same as a proper one. 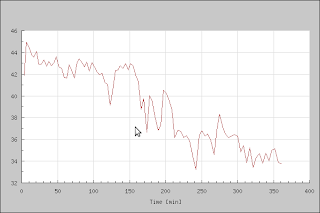 OK, so you can argue that perhaps it's a little less easy if it's mounted on the bike. That might be so. However, I still think it won't be difficult to open. And besides, why take the risk ? fixed objects for even more security. 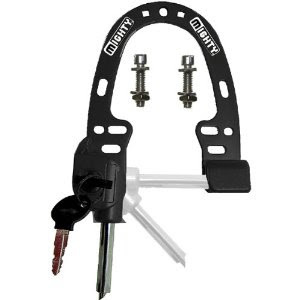 If you want a lock which mounts permanently on your bike and is actually secure, then what you need is a proper Dutch lock. The AXA Defender and AXA Victory are amongst the very best. These are what we fit by choice to our own bikes. They're robust and reliable. Well made. Optional cables and chains fit to a socket on the side for additional security without having to fumble around for a key. You can buy the AXA Defender, AXA Victory and a wide range of add on cables and chains (including the ART approved DPI 110) in our shop. We don't, and won't, sell the Mighty Amsterdam or similar not quite real products. Many quality products are made in China these days. The "Mighty Amsterdam lock" isn't one of them... Oh, and AXA aren't completely blameless. While the "Defender" really is very good indeed, a few of their earlier models had a fatal flaw and should be replaced. Freewheeler recently pointed out to me that the London Cycling Campaign had used some of my photos in this video. They asked before-hand and were polite enough to include credit. This makes a difference. Also, it's a very good thing that they are publicizing the danger due to this dreadful infrastructure. The video shows what is a remarkably common situation in the UK - of cyclists having a choice of riding along a horrifically busy road or of taking to a narrow, badly designed cycle path with crossings of the same road. Sometimes the speed limits on such roads are 70 mph (112 km/h) and they are not well enforced. Indeed, the new government in the UK says it is ending the "war on the motorist" - something which never actually existed, of course. The Wikipedia article about this road puts it as follows: "Between Thursley and Milford (near Guildford), cycle crossings of the slip roads have been constructed on both sides of the carriageway for the few cyclists travelling on this dual carriageway." It is of course no surprise that "few cyclists" would use such a route ? It's hardly a glowing example of subjective safety. Indeed, this lack of comfort when cycling is exactly the reason why cycling is flatlining in the UK. Thursley and Milford are just four miles (six kilometres) apart. However, the direct route means taking a trip along this road. Who but the most dedicated cyclist is going to do that ? It may as well be a thousand miles, and indeed people often believe as a result that the distance is "too far to cycle". Such infrastructure is extremely effective at preventing cycling. Also read an article which compares the most dangerous junctions in London and the whole of the Netherlands. One of the things Assen is most famous for is the Motorcycle TT. It's a huge event in the city, attracting around a hundred thousand visitors for the racing, and many who camp for a few days beforehand as well. It's easily the biggest event in Assen, and visitors outnumber the 65000 people who live here. This happens with remarkably little disruption of city life, except that supermarket shelves are stripped clean of some items. Wednesday, Thursday and Friday night have had live music on stages around the city. I had work to do on Thursday and Friday so couldn't stay out late (as a result I've still not seen Mooi Wark live - they were at half past midnight on Friday morning). However, no work today so we did go along last night. An excellent event. As usual with a big event in the city there was simply not enough cycle parking to go around, even in places like that shown which are not actually bicycle parks at all. Bicycles are overwhelmingly the method used by locals to get into the city for events. And we spent a bit of time drinking a few beers and listening to music before riding our bikes home in the early hours. A great night out, in the company of around 40000 others who were also enjoying the evening's events. A few posts ago I pointed out that the Netherlands spends around 487 million euros per year on cycling infrastructure. That is what is spent in this country of 16 million people. The world's best cycling infrastructure costs: 30 euros per person per year. It perhaps sounds like a lot - especially in these days of "austerity". British people, and those from the USA, Australia and other countries with little cycling, often claim that a lack of money is the reason why proper cycling infrastructure cannot be built. It's not true, of course. It's just one of many excuses. By the standards of most government expenditure, this is actually not such a huge amount of money. Britain's budget, just announced, is full of cuts to services. However, while 4 billion pounds has been cut from the transport budget, that still leaves 22 billion pounds allocated to transport. There was no increase in the cost of fuel for motor vehicles. Such an increase may come later due to the rising cost of oil, but the British government is trying to minimise its effect on drivers by keeping the price of motor fuel down. Meanwhile, cycling will be expected to continue on virtually no funding at all. Around 0.3% of the transport budget in the UK is spent on cycling. This continued under-investment is what has lead to the hostile environment for cyclists, and the bad safety record of cycling in the UK. However, even now, investment in cycling should not be seen as a cost. Cycling has many benefits for society as a whole. If people cycle, this helps the economy by reducing the requirement to import oil and has many health benefits. Encouraging cycling is good economics. It's been shown that even in the UK, investing one pound in cycling brings four pounds of benefits. In 1949, British people travelled 23.6 billion kilometres by bicycle vs. only 20.3 billion kilometres by car and taxi combined. In the Netherlands now, people cover about a tenth of the kilometres each year by bicycle that they cover by motor vehicle. Instead of trying to keep the cost of motoring down, Britain's drivers could instead be helped by reducing their dependency on cars. 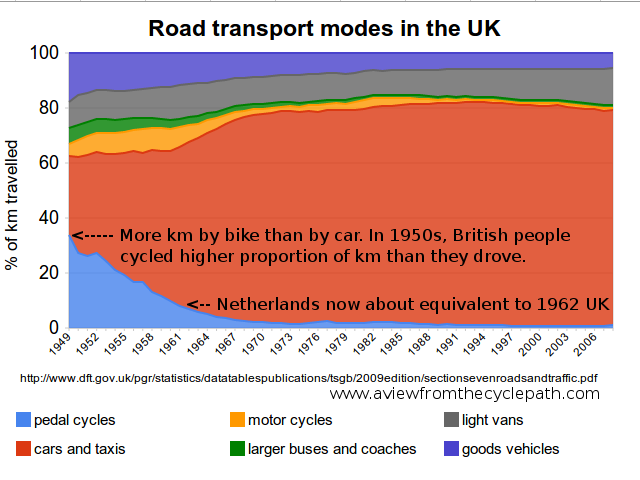 British people were not always so dependent on cars. Rather, over the last 60 years the British public has been forced to drive for an increasing proportion of journeys due to there being few other good options (i.e. options which are attractive, offer direct journeys, have a high status and good subjective safety). If it were made easier for people to make a choice other than the private car, more could / would cycle. Yes, I know people make other excuses, but mostly the concerns are simply about safe conditions for cycling. I've dealt with most of the common excuses before. Of course, even when we're supposedly short of money, some things are immune to budget cuts. While there is "not enough money" for proper infrastructure, other more "important" things continue to have plenty of funding. For instance, Britain may be heavily in debt, but the country is still keeping its nuclear deterrent, upgrading of which is expected to cost 65 billion pounds over the next few years. 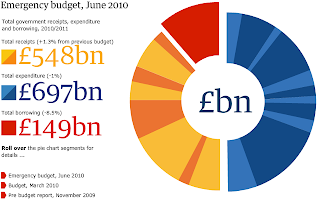 I also recently learnt that Britain's adventures in Iraq and Afghanistan have cost 20 billion pounds over the last 9 years. That amount is in addition to the usual defence budget (around 40 billion a year, and not being cut with the budget), and does not include either troops' salaries or care for the wounded. This alone comes to 37 pounds per person per year for that period - a larger amount than the Dutch spend on cycling infrastructure. I'm not even slightly convinced that the wars in Iraq and Afghanistan are justified. In 2003 I marched in in London together with a million other people and all our voices were ignored. It's part of the reason I grew disillusioned with the UK. The reason given for starting the war in Iraq was bogus, and obviously so from the beginning, the cost in human lives has been enormous, and it seems that violence simply continues to escalate in Afghanistan. So what exactly is the point ? If money is short, which is the best use of it ? Destroying another country's infrastructure and killing hundreds of thousands of people, storing up hate for the future, or building up ones own infrastructure and saving lives in the process ? For more cycling, what Britain, and the other countries with little cycling, need is very simple. More decent quality cycle paths. Quite apart from all the wasted lives, resources and political good-will, we now know that the failed wars in Iraq and Afghanistan have cost 30 billion pounds. i.e. enough to fund cycling at Dutch levels for at least 25 years. Well managed, that could have been enough to catch up with the Netherlands. Of course, to talk about cycling as a cost at all is actually short-sighted. The Dutch have repeatedly shown that GOOD cycling infrastructure is cheaper to build than not to build. What's more, cycling has been shown again and again to have many positive effects both in society and even for business, all of which lead to cycling having an overall positive effect on the economy. Britain isn't alone in spending more than it can afford on the military. I made a comparison of several countries a little while back. The attitude towards cycling infrastructure varies with its quality. The attitude towards separate cycle infrastructure varies as much as the quality of it. In Germany some cyclists feel ‘pushed off the road’ by their separate ‘on-sidewalk’ mandatory cycle paths. In English speaking countries some cyclists are also reluctant to give up their ‘right to use the roads’, a feeling which is enhanced by a strong ‘them versus us’ culture. There is a very different attitude in the Netherlands. The conflict of interests is just not there. First of all because the Dutch don’t think in terms of drivers versus cyclists (everybody can be both) but also because they feel each type of traffic has the infrastructure it needs and deserves. And many Dutch think ‘it has always been this way’. Early 20th century cyclist on a cycle way separated from the road by a hedge. It is impossible to single out one reason to explain this. There are complex cultural, political, financial and historical reasons that all contributed to today’s attitude. But it is interesting to focus on one of the historic reasons. When mass cycling became common in the Netherlands from the 1890s the cyclists had to deal with roads that were totally inadequate for cycling. Most roads were not paved at all. The state highways had been constructed for horses and carriages and they had been neglected because of cuts in maintenance in favour of what was considered more modern rail transport. In order to make cycling possible at all new roads for cyclists were necessary. And they were indeed built. At first next to the highways, but then an interesting problem arose. 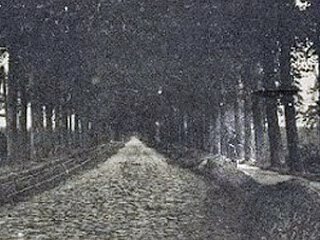 Since the cycle paths were so much better than the roads they were soon invaded by horsemen and carriages. This lead to protests and eventually in 1905 to a new Road Law that was very specific in the protection of cycle paths. It forbade non-cyclists to use them. And it also gave the cycle paths the legal status of ‘road’, to be used by cyclists only. It was only after this law was in force that cars became common. They too were forbidden to use the cycle roads. 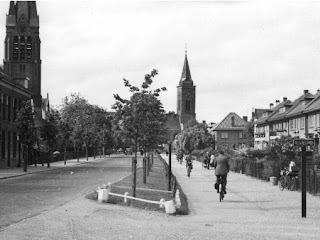 But it was hard to enforce with the smooth cycle ways that were so much more comfortable for those early cars too, directly next to the poor roads. So the pragmatic Dutch simply created a division. A hedge or a line of trees between the road and the cycle way and the matter was settled. By the 1920s it had been laid down in National Law that the construction of these separate cycle paths was mandatory on roads with more than 500 cyclists passing per day. When the cyclists’ union looked back in the 1930s to three decades of practise, they were very satisfied that this solution had also improved overall road safety. 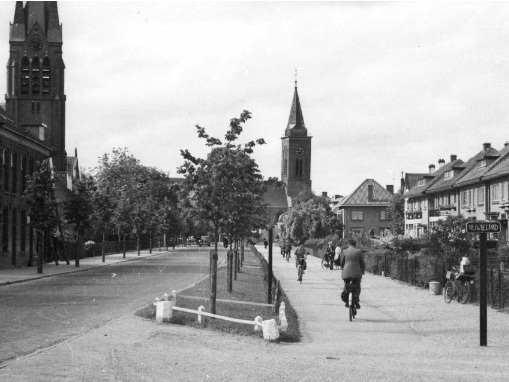 Implementation in cities was interrupted by WWII but from the early 1950s the separated cycle paths became more common in city streets too. Much has changed since the early 20th century. 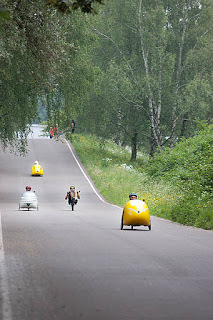 Motorised traffic now has its own good roads, and there was a decline in cycling that was overcome again, but that ground attitude has always remained. It were not the cyclists who were sent off the roads. It was motorised traffic that was sent off the cycle paths for the benefit of all. This basic attitude has been such a long tradition that it is incorporated in the way of building and thinking about roads. No driver will ‘invade’ a cycle path, not even now, not even if he can. Please note that this is not a safe roundabout design. 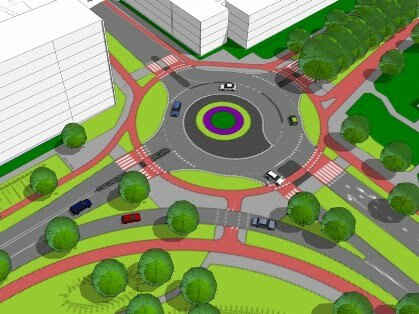 The basic design has been shown to be seven times more dangerous than the preferred Dutch design, and multiple motor lanes shown leading into the roundabout will further degrade safety leading to similar situations as have prompted protests in the Netherlands. What has been a growing tradition in the Netherlands for over a hundred years can be adopted by other countries too. On highways and through streets with a high volume of motorised traffic at increased speed you need smooth, wide, clear and well maintained cycle paths separated from that motorised traffic to improve overall traffic safety. In city streets with moderate traffic volumes and low speed differences you can create complete streets which are fit to be used by all types of traffic including cyclists and pedestrians. On Sunday, 20th of June (i.e. 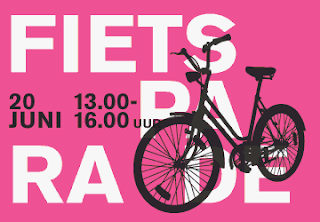 this Sunday coming) there's a Fietsparade in Groningen at the Vismarkt. This includes a tour through the city. The event lasts from one in the afternoon until about 4. And of course you're welcome on your bike too. These days there is just one bicycle manufacturer left in Groningen. 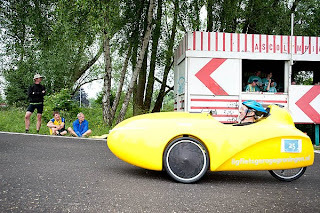 Sinner Ligfietsen, building a range of recumbent bikes and trikes including the rather wonderful Mango velomobile, and of course we'll be there too. I didn't get any particularly good photos or videos. However, Wilfred did. This is his video, and there are photos on his blog. The image above is from a cycle path which I use for a good part of my commute. I've written before about how this path is great for commuting at a decent pace, and shown how this cycle path has priority over side roads. The cycle paths here are 2.5 m ( 8 feet ) wide, that's the minimum allowed for a unidirectional cycle path. Such paths should also be separated from the road by a minimum of 1.5 m (just short of five feet), however, in this case, the separation is actually about 4.5 m ( 14 and a half feet ). Back in Britain there is currently a campaign called "3 feet please", which is asking merely for motorists to give cyclists 3 feet ( 0.9 m ) of clearance as they pass cyclists. The campaigners behind this correctly notice that "Fear of traffic" (i.e. a lack of Subjective Safety) prevents people from cycling in Britain, but their suggested fix is woefully inadequate. "3 feet please" didn't originate in Britain. It is actually an idea that the British have imported from the USA. The problem is that while this passing distance requirement is law in some American states, the cycling rate in the USA is just as low as it is in the UK. 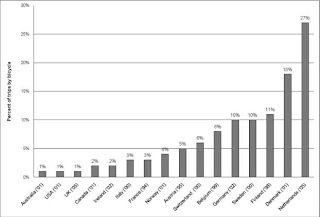 Britain copying America or America copying Britain is never going to result in a high rate of cycling (and you can add any of the other English speaking countries to this. Australia, New Zealand etc. They all have about the lowest rate of cycling it is possible to have). It's no good looking to where people don't cycle to find ways to encourage people. You need to look to where people cycle a lot. The Netherlands leads the world by a wide margin. 3 feet is not enough. Complete segregation of cyclists from motorists is what is actually required to make the masses feel that cycling is safe. It's also required to make cycling efficient and safe. This can be achieved by a combination of two means: high quality cycle-paths with proper traffic light and roundabout design, and by treatment of roads to achieve segregation without cycle-paths. The concepts of Sustainable Safety lie behind the Dutch success. The Dutch highway code tells drivers to pass cyclists with a minimum 1 to 1.5 m gap. However just like everywhere else this doesn't mean it actually happens because just as everywhere else, drivers make mistakes. What keeps cyclists safe in the Netherlands is not tbe law but the physical infrastructure which exists where most cycled journeys are made. To learn from the Netherlands it is necessary to emulate the things which really make a difference here, not just anything which is "Dutch". Note that the example cyclists are shown riding side-by-side. That's normal in the Netherlands. This infrastructure isn't only for high speed adult commuters. I also made a video showing how school children use this same cycle path to get into the city from a village. Note also that in this instance the cycle paths have a concrete surface which is smoother, and faster to ride on than the asphalt of the road. This type of surface is increasingly common in the Netherlands. Something that has long amazed me is that people actually claim to enjoy driving cars. I find driving for everyday journeys is quite excruciatingly boring. I could see the attraction if people went to track days and raced around with other like minded people. A bit of speed, a bit of danger, testing your skills etc. I think I could enjoy that myself. After all, racing bikes is great fun. However, it seems that a remarkably small number of people who claim to like driving cars actually ever do it competitively at any level at all. Except perhaps on a computer screen. I really think that's a shame. Anyway, back to the boredom of driving... Cars manage to make speeds of over 100 km/h ( 60 mph ) a sleep inducing experience. Bicycles make 50 km/h ( 30 mph ) into a fairly scary experience which demands that you're alert, and 80 km/h ( 50 mph ) down a hill on a bike is quite terrifying. I always think of all the things that could go wrong, and how injured I'd be if they did. I think boredom explains an awful lot of why there are so many deaths and injuries on the roads. So many SMIDSY (Sorry Mate, I Didn't See You) type incidents. Drivers are simply bored, or distracted by something more interested, and not concentrating. There are regular campaigns around the world to encourage drivers to sleep well before driving, take breaks every so often on long journeys etc. but this is frequently ignored. This boredom is a good part of the reason why campaigns to encourage drivers to behave perfectly never actually work. It doesn't really matter how good a driver you'd like to be if you're half asleep at the wheel. Crashes due to drivers falling completely asleep are quite common. Other incidents due to loss of concentration are also common. In fact, driving is so sleep inducing that even an insomniacs' website warns of the dangers of falling asleep while driving. Campaigning for drivers to always behave perfectly, and for cyclists to always behave perfectly, will never eliminate this problem. Cyclists will continue to be the victims of crashes with drivers while bikes are mixed with cars on the roads. Separating the modes is the only way of significantly improving the safety of cyclists. It worked here in the Netherlands, where cycling is safer than in any other country. 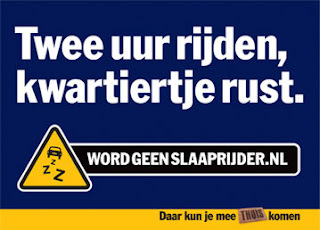 The poster image is from a Dutch campaign against "slaaprijden." It reads "2 hours driving, quarter of an hour rest - " It is one of many such pieces of advice being handed out on the campaign website. These posters appear beside the motorways in order to remind drivers of the importance of taking a rest from driving. So I'm going to stick to riding bikes (and trikes) for most of my journeys. I'll stay awake, and I'll enjoy the experience. I've always seen driving as a boring activity. I was 27 before I bothered to learn to drive. On moving over here my license became invalid and for over two years I had no legal driving license at all, which was no problem as I didn't need to use a car in that time. In December I got a Dutch license, primarily so I can take my turn with driving the company van. One of my favourite videos showing driving as a boring activity is here. On the 5th and 6th of June I and many others will be at the Cyclevision event in Sloten, Amsterdam. This year I'll be on the Sinner stand for at least part of Saturday, and I'll take part in just one race - the six hour race on Sunday. Or, take a look at some videos from last year's cyclevision. 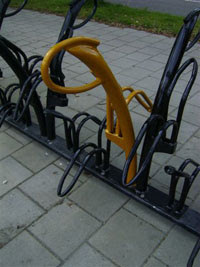 In 1999 a programme called "Room for the bike" began, aiming to increase the amount of cycle parking at Dutch railway stations. The 200000th new cycle parking stand due to this programme has just been installed in Hardenberg. It's coloured gold. The 200000 are made up of 157000 unwatched stands, 30000 watched places and 13000 cycle lockers. 60000 more cycle parking spaces at railway stations will be installed by 2012, and ProRail promises to keep up a rate of building 25000 new spaces per year at least until 2020. The result is that the entire country has an enormous ratio of bicycle parking spaces available to the population of the town in which they exist. Some of the cycle-parking at Assen railway station, expanded under this scheme. Assen, where we live, has a cycle-parking space at the railway station for every 25 citizens. Groningen has better than one space for every 20 people, the village of Beilen has enough for one in fifteen and the small town of Meppel has enough for one in twelve. Read all stories on this blog about railway station cycle parking. The cycle stand shown at the top is a "Tulip" design. These are the very best cycle-stands. Read why in a previous blog post previously.